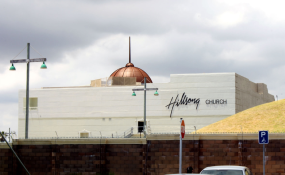 The two robbers who targeted Hillsong Church in Century City, Cape Town, on Monday gained entry by pretending to be delivery men, the says the church. "There were four staff members in the building at the time, including a security guard who called the police. No one was hurt. The perpetrators are still at large and police are investigating," the church said in a statement. The church said there were security measures in place at the building and indicated that it was considering additional ways to further ensure the safety of the congregation and staff. "The incident has only served to strengthen our resolve to build a church that will help build this nation, which we love, and which we know God loves deeply too," the church said. It also thanked the police and Century City security services for the way they handled the situation. "We are very thankful that everyone is okay," the church said. Western Cape police spokesperson Sergeant Noloyiso Rwexana said the two men entered the church and robbed employees of their cellphones. "It was not a hostage situation," said Rwexana, in response to claims on social media after police flooded the area. "The circumstances surrounding this incident are under investigation with no arrests as yet."